DEVELOPING: We're getting reports of some sort of construction crane collapse/malfunction at the site of the future state Public Utilities Commission building at 525 Golden Gate Avenue (near Civic Center behind the state court). Part of Polk Street is now closed to traffic and there's debris lying in the street on Golden Gate. We'll update you as we know more. Update: Alert SF sent out the following heads-up at 11:45 am: "Due to police activity and the street closures to pedestrians and vehicles around the Civic Center area we are requesting everyone please avoid the area. This is inclusive of Golden Gate Avenue to McAllister Street on Polk Street." Please be advised. Update 12:20: KCBS says the roads in the area of Golden Gate and Polk Street are closed. "Fed Bldg employees told to stay put after suspicious pkg left in the area." Update 12:29: kiskerfuffl just sent out the following image of the lovable bomb sniffing robot. Update 1:45: A massive explosion just occurred outside the Federal Building, and one witness describes many bystanders standing around in stunned silence, but no one injured. 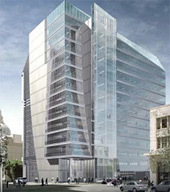 A rendering of the finished building at 525 Golden Gate.